A smoke alarm is an inexpensive, easy-to-install piece of plastic that, according to the American Red Cross, is also the most effective tool in preventing fire fatalities. That’s why the organization launched its House Fire Campaign nearly two years ago with a goal to reduce fire-related injuries and deaths by 25 percent in five years. To date, the organization has installed nearly 500,000 smoke alarms nationwide that saved 111 lives. Duke Energy employee Jim Gilreath and American Red Cross representative Tanner Lalonde prep before installing smoke alarms. 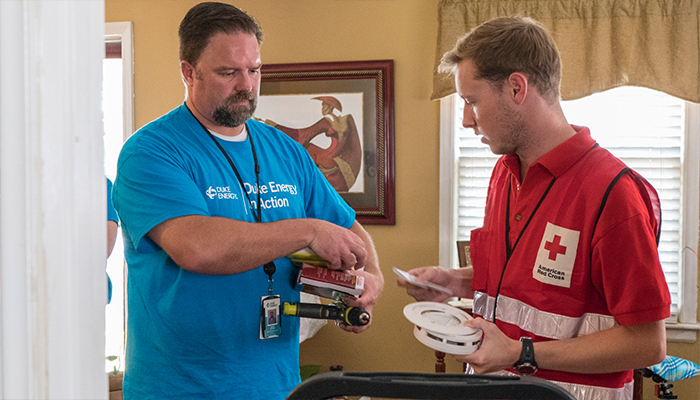 In September, Newcomb led a team of 14 volunteers from Duke Energy and six representatives from the American Red Cross to install smoke alarms and replace batteries in the Washington Heights neighborhood of Charlotte, N.C. Volunteers installed two smoke alarms for Keith Roberts, who recently moved into his 93-year-old mother’s house so she wouldn’t be alone. He said knowing her home has a working smoke alarm gives him peace of mind. The Charlotte chapter has installed more than 1,200 smoke alarms in Mecklenburg and Iredell counties since implementing the House Fire Campaign in 2014 and plans to install 1,200 more this year. According to Newcomb, one-third of Americans do not have working smoke alarms, which results in an estimated 2,000 of the 3,000 annual fire-related fatalities. The organization leads a neighborhood outreach effort like the one in Washington Heights monthly. They will also install alarms at any home on request. More than 250 volunteers have helped install the alarms and remind residents to have an escape plan in case of a fire. Need a smoke alarm? Call the American Red Cross. If you need a smoke alarm or help installing one, an American Red Cross chapter near you can help. At a minimum, the organization recommends one alarm on each floor inside bedrooms and outside sleeping areas. To request a smoke alarm for your home, find your local chapter here. Tanner Lalonde installs the smoke alarms for the American Red Cross through the AmeriCorps Ready Corps program, where members spend 10 months on disaster preparedness efforts. The new smoke alarms and lithium ion batteries will last for 10 years. The American Red Cross keeps track of the homes where alarms are installed and will visit again in roughly 9 1/2 years to install a new one. Even though the lifespan is 10 years, the organization recommends testing your batteries monthly and changing batteries with shorter lifespans when you change your clocks for daylight saving time – the second Sunday in March and the first Sunday in November.